The Bromley Companies is pleased to announced the completion of several significant upgrades to its technology infrastructure at 120 and 122 Fifth Avenue in New York City. 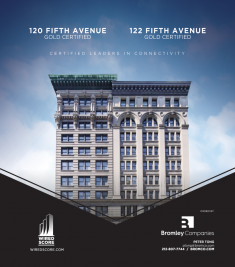 Both 120 and 122 Fifth Avenue have been certified “Gold” by WiredScore . The WiredScore Gold certification provides tenants with access to best-in-class internet providers, as well as full distribution of fiber connectivity throughout the building ensuring that tenants are protected from service interruptions. Today, tenants at 120 and 122 Fifth Avenue have access to unique sources of high-speed fiber or copper connectivity from six internet services providers which include Verizon, Time Warner Cable, TW Telecom, Megapath, Lightpath, and Windstream. The building’s infrastructure is well prepared for the unexpected; it has multiple points of entry for connection diversity in case one entry is damaged, and dedicated spaces to protect telecom equipment. In addition to achieving Gold certification for connectivity, 120 Fifth Avenue has rolled out a wireless building and elevator access system which can be activated using any smartphone or Apple Watch. The system provides tenants 24 hour access via Bluetooth to the building lobby as well as elevator access to tenant floors. The app on tenant phones or Apple Watch makes it easier to roll out and manage system for tenants and simple and secure for building employees to use. The Bluetooth based system is one of the first deployments in New York City of the technology of an office building. “While technology and media companies are attracted to the high ceilings, historical character of 120 and 122 Fifth Avenue, we have made these significant investments to improve the technology in the buildings to meet the demanding needs of our tenants,” said Michael Borrero, Vice President of Property Management of Bromley. These significant infrastructure investments have paid off, attracting a mix of Fortune 500 and emerging tenants at the buildings including the corporate headquarters of Barnes & Noble Inc as well as officers for Carters/Oshkosh, Chanel and Centric Digital among other industry leaders. 120 and 122 Fifth Ave. located between 17 and 18th street on lower 5th Avenue, are fully renovated, adjacent buildings with a combined 305,000-square feet of office and retail space. The properties are owned and managed by The Bromley Companies (www.bromco.com), a national investment and development company. Founded in 1972, Bromley Companies is a New York based real estate development and investment company which owns and manages over several million square feet of office, retail, residential and industrial space. The core of Bromley’s portfolio is located in lower Fifth Avenue in New York City with additional holdings in the Midwest and Southeast. Additional information can be found at www.bromco.com.